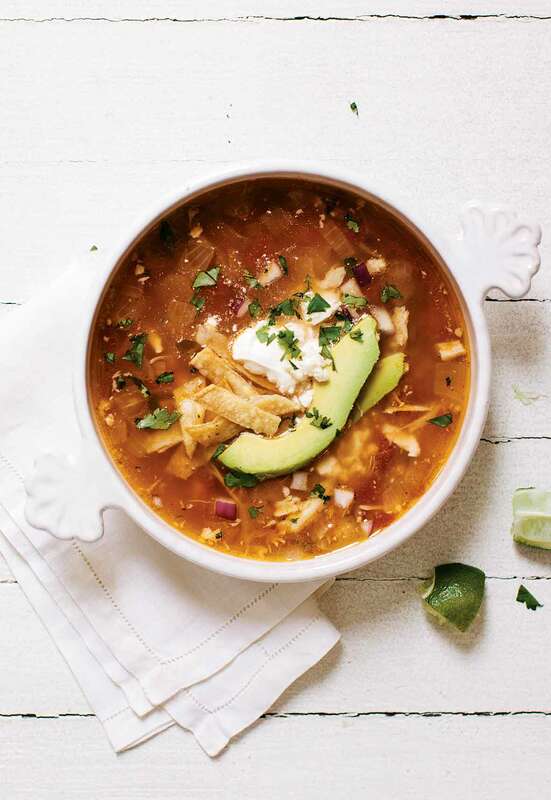 This easy chicken tortilla soup is a simple, no-fuss, Mexican-inspired weeknight meal that can be on the table in under an hour. This brothy mix of chicken, tomatoes, onion, garlic, jalapeño is topped with baked tortilla strips and all your favorite fixings. Here’s a soothing weeknight dinner fix with a ridiculously high taste-to-effort ratio. Grab a rotisserie chicken and a stash of broth, add some pantry staples, and in less time than it takes to get takeout, you’ve got a family-friendly soup that each picky palate at the table can customize with toppings. 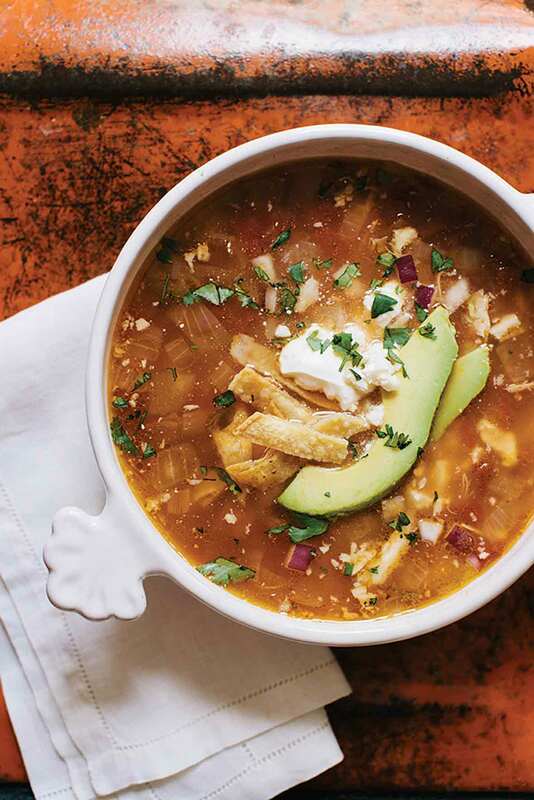 Sorta like the Mexican tortilla soup equivalent of Taco Tuesday. 2. Using a sharp knife or pizza cutter, slice the corn tortillas into 1/4-inch (6-mm) thick strips. (The kids can do that if they’re helping in the kitchen!) In a large bowl, toss the tortilla strips with 1 tablespoon of oil and a pinch of salt. Arrange the strips in a single layer on a rimmed baking sheet and toast, stirring once after 5 minutes, until the tortilla strips are golden and crisp, about 10 to 15 minutes. Set aside to cool. 3. In a food processor, whiz the onion, garlic, and jalapeño into a paste. 4. In a large pot set over medium heat, warm the oil and sauté the onion mixture until softened, 5 to 7 minutes. Stir in the tomatoes, salt, chicken stock, shredded chicken, and lime juice. Bring the soup to a boil, then reduce the heat to low and simmer for 5 minutes or until everything is heated through. 5. Ladle the soup into the bowls and top each with a handful of tortilla strips. Serve, passing the optional toppings on the side, if desired. In a 6-quart slow cooker, toss in the carcass from a 4- to 5-pound (1.8- to 2.3-kg) roasted chicken, meat and skin removed. Reserve the meat for use in the soup. Add 2 celery stalks, 2 carrots, 2 medium halved onions, 2 bay leaves, and, if desired, a small handful herbs of your choice, such as parsley or thyme. Add enough water to cover and cook on low for at least 8 hours and up to 24 hours. Using a fine-mesh sieve, strain the finished stock into a large pot. No time to make chicken stock from scratch? Not even in a slow cooker? No sweat. You can substitute 6 cups of your favorite high-quality store-bought canned broth in this recipe. Although if you have a few minutes to spare, you’ll be astounded at the difference in taste when you take just 20 minutes to impart additional oomph to the store-bought stuff. This is especially imperative in recipes such as this in which broth is such a prominent feature. We dub this Cheater’s Chicken Stock. Here’s how: Dump your canned or boxed broth in a pot and toss in whatever else you would usually add to stock, such as onions, garlic, bay leaves, carrots, herbs, what have you. Also toss in either the carcass from a rotisserie or roast chicken that you’re using for the soup or, for a richer flavor, a couple bone-in, skin-on chicken pieces. Add a little water to the pot, being careful to add no more than half the amount of broth. Then gently simmer for at least 20 minutes or, if using raw chicken, until it’s cooked through. Strain and use. 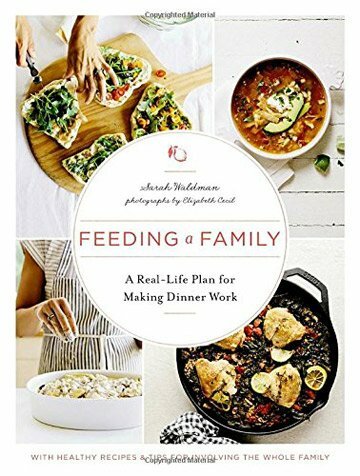 Easy Chicken Tortilla Soup Recipe © 2018 Sarah Waldman. Photos © 2018 Elizabeth Cecil. All rights reserved. All recipes and photos used with permission of the publisher. I believe this is a recipe that has a high taste-to-effort ratio. Shredding the chicken takes a little work, but everything else is pretty short. Naturally this is only as good as the stock you use, so make sure you use a good stock! While I made this recipe with chicken, there's no reason that this wouldn't work with turkey, and I think it's a great way to eat Thanksgiving leftovers. If you’re like me, you make a stock with the carcass immediately and there's plenty of leftover turkey meat to use with this recipe. For the amount of jalapeno I used it did not taste spicy. I would probably use a whole jalapeno next time. Overall, very easy to make and highly recommended as a weeknight meal. This was a delicious winter soup for chilly evenings. The paste of pepper, onion, and garlic gave the soup a fabulous consistency. I used fire-roasted tomatoes because I had those on hand. Further, I used store-bought broth and a rotisserie chicken. I used one whole jalepeno. The crisp tortillas took right at 10 minutes at 375 degrees. Will be making this again for family and friends! The only change to the recipe is I would do fire-roasted tomatoes every time. My family really liked this soup and it was easy to prepare. I try to make stock whenever I have leftover chicken bones, and I already had a couple of quarts in the freezer. I pretty much had everything else in the house as well, so it came together in a snap. The toasted tortilla strips and the garnishes are what make this interesting, so I wouldn't skimp on those. Making the “sofrito” in a mini-chopper was a great idea. After that went in the pot, I pulsed the tomatoes a few times as the pieces in the can seemed large for soup. My only quibble is that the soup base doesn't exactly scream Mexican to me. If you are making stock for this purpose, I would definitely add some Mexican oregano or cumin or a seeded dried chile pepper to the broth. If you already have plain broth, you could put some of those spices or a little bit of chipotle (or the adobo sauce from the chipotle can) into the soup while simmering. All in all, a great way to repurpose chicken leftovers and stretch a rotisserie or roasted chicken into a second, probably very different from the first, meal. Broth-based soups are always on my radar, so I was very eager to try this one, and it certainly didn’t disappoint. The homemade chicken stock, in my view, is key to the richness of this wonderfully bright and flavorful soup! The variety of toppings add a fun way to customize each bowl to individual tastes. We went with the lime wedges and cilantro. We loved the addition of lime juice! The toasted corn tortilla strips added to the soup kept a little of their crispness in the liquid and created a noodle-like texture to the bite. I would recommend making more of the toasted tortilla strips, so you have enough for the soup, as they were quickly disappearing after coming out of the oven! Very tasty! I made the stock overnight in my slow cooker from 2 small rotisserie chicken carcasses and the house smelled wonderful in the morning when we got up. I added fresh parsley and thyme sprigs to the stock along with the veggies. The resulting stock had a beautiful amber color and a rich and delicious flavor, unlike the rather colorless and bland-tasting stocks that you purchase in a grocery store. This was a great-tasting stock with very little effort! Yum! I’m low carbing but it won’t be hard to simply skip the tostada strips. I’ve also got some summer tomatoes I canned at the end of the season that I had actually forgotten about before I went into a seldom used closet today and rediscovered them. Gotta endorse slow cooker stocks, too. Nothing releases all that collagen like 24 hours of slow simmering! I’ve got a nice technique for enjoying a cup or two while it simmers. I put a large strainer into the slow cooker’s liner. Keep the edge above the surface of the broth. Then you can ladle out what you want want to sip. Love your tip, Rainey, thanks so much! Now I can have a little taste test along the way. Even when it’s finished I find it easier to strain most of the liquid that way and then have a much smaller volume to pour from an awkwardly shaped liner (mine is heavy and rectangular). Whatever makes cooking easier is always a great plan!